over portables, you realize that you need the ultimate protection from power outages by getting a whole-house backup generator. One of the biggest questions we receive is, "What's the difference between a home standby and whole-house generator?" Standard home standbys are capable of powering smaller homes with a kilowatt (kW) range from 9kW to 20kW. They have smaller, air-cooled engines that provide short-term power to mission-critical items like an air conditioner, sump pump, and refrigerator in addition to some lighting, but aren't well-suited for powering everything at once, backing-up larger homes, or running for extended periods of time. Whole-house generators, on the other hand, range in capacity anywhere from 22 to 48kW. The added power brings you peace-of-mind knowing you won't have to sacrifice or make difficult choices like choosing whether to run a single air conditioner or a large commercial-style refrigerator. Instead, your house will be close to fully functional, as if nothing happened at all. Whole-house generators offer many benefits over the typical standby generator. They feature larger, more powerful engines that are liquid-cooled for longer run times without maintenance, sophisticated programming for better load management, and provide better fuel options like natural gas, liquid propane, and diesel. In many coastal and remote parts of the country, finding an abundant fuel source necessary for power generation can be problematic. In fact, an essential step in selecting the best standby for your home is identifying the fuel type. Unlike small home standbys that can only use natural gas (NG) or liquid propane (LP), whole-house generators also come with a diesel option, that makes generator power more accessible. 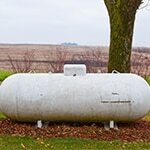 Both LP and diesel fuels will require tanks large enough to run the generator correctly. Similarly, the natural gas meter and gas lines will need to be the correct size. Before installation, your contractor will verify this with you, but you can find this information in the installation manual on our product pages. Proper sizing of your generator is crucial to the success of any installation and requires a good working knowledge of electricity, as well as the load requirements of your home's electrical appliances. When analyzing electrical loads, look at the manufacturer’s data plate on each major appliance or piece of equipment to determine its starting amperage. Next, use the following formula to help determine the total starting wattage of all of your appliances: (Starting Amps x Volts = Watts). To get kilowatts, divide the number of watts by 1,000. When choosing the generator output, select a rating that is approximately 20 to 25% higher than the peak load (for example, if the total expected wattage is about 22 kilowatts, choose a 27 kW generator). A higher-rated generator will operate comfortably at approximately 80% of its full capacity and will provide a margin of flexibility if the load increases in the future. The most significant wattage draw will come from central air conditioning units. To determine an air conditioner's size in "tons", just divide the number of BTUs by 12,000 (Tons = BTUs/12,000). For example, a single 5 Ton Unit is equal to 60,000 BTUs. All standby generators are rated by kilowatt (kW) (1 kW = 1,000 watts) which measures the capacity or total load that the generator can handle. For homeowners wanting the ultimate entry-level whole-house standby, a 22kW is a perfect choice to reap all of the benefits of a whole-house generator over a regular home standby. A generator in the 27-36kW range is perfect for most homes since they replace 75% of the 200 amps coming into your electrical panel. Since these generators are equipped with advanced load-managing hardware, like A/C shedding, you will hardly notice that the air conditioners kick on at different times, so they don't overload the system. If you want to backup the entire house as if a blackout never occurred, a 48kW generator is capable of producing a whopping 220 amps of electricity at 240 volts, which is nearly the same amount of power coming from the utility. Just like a light bulb needs a switch to turn on, your generator needs one too. An automatic transfer switch (ATS) allows your standby to spring into action the moment a power failure is detected. It does this by continuously sensing utility power, and after an outage is detected, it simultaneously starts the engine and disconnects electricity coming from the line and energizes your home's panel through generator power. Getting the right switch is just as crucial as getting the right generator as they work together to restore lost power. To know which will work for you, you'll need to know the amperage of your electrical service panel. 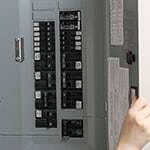 You can check this by locating the main breaker in your electrical panel (usually the big pull-out at the top). Typically, the average sized home has a 200-amp main breaker, so the maximum amount of electricity your home can consume is 200 amps. It's essential to get the same amperage switch as your home's panel. If you have 200-amp service, you'll need a 200-amp transfer switch. Now that you know how to pick the perfect whole-house standby generator, you can be confident that your home will be protected against power outages of every kind. You no longer will have to feel vulnerable during the next blackout; instead, you'll become the superhero who saves the day! Whole House Generator Buyer's Guide.. Our Power Equipment Direct how-to library can help you learn about How to Use a Generator for Tailgating, How to Get the Right Generator for Your Home and How to Save Electricity with Load Shedding.